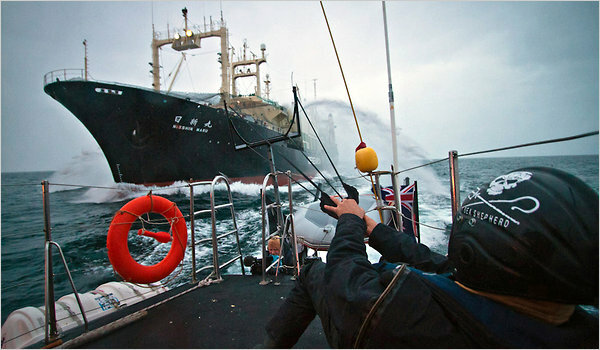 The New York Times reports that the Nisshen Maru (aka the Nisshin Maru), which Matthew Barney fans will remember as the setting for much of Barney's Drawing Restraint 9 has been recalled to port after repeated harassment from anti-whaling organizations. "The [Japanese agriculture] ministry said the group [Sea Shepherd] had harassed the Japanese ships by shining laser beams to temporarily blind crew members and throwing flares onto the whaling vessels. Agriculture Minister Michihiko Kano told reporters on Friday that the decision to recall the fleet was made to ensure the safety of the crews and ships. The ministry said its whaling fleet had often been able to simply outrun the environmentalists. It could not do so this year because Sea Shepherd had faster vessels, the government said." The Times goes on to note that the, "demand for whale meat is declining. Few Japanese eat whale anymore, and the meat from the hunt has piled up in freezers, or been given to children for school lunches." Video mash-up of Eminem's Super Bowl ad for Chrysler with the trailer for Matthew Barney's Cremaster Cycle. Of course, Chrysler Imperials (and the Chrylser Building) play important roles in Cremaster 3, but we can't help wishing they used clips from the Khu video. 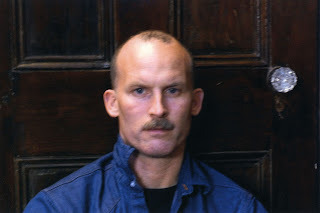 Matthew Barney Performances in New York City? In a recent article, 032c magazine reports that the next segments of Matthew Barney's Ancient Evenings series will be performed in New York City. "After the upcoming Detroit KHU premiere, Barney plans on doing a series of performances in New York City that would encompass the next few of acts of the opera, bringing his latest project back to his old creative stomping grounds." We'll keep you posted as we receive more information!